Located at 133 Garside Ave.
Our pool has over 15,000 square feet of swimming area with a large flume ride, drop slide and diving board. The pool also features a handicapped and child-friendly zero depth area with interactive play activities including a small fish slide, geysers and various other water play activities for children and adults alike. A separate tot pool is also available. Since opening in 2006, we have added multiple 16’ and 30’ diameter umbrellas at various locations around the pool deck to provide additional shade for our members. An extra wide staircase has been installed in the water next to the lap lane to allow our members easier access to the 4’ deep water. Outside the water are two children’s playgrounds, a basketball court, bocce, sand volleyball, tetherball, ping-pong, shuffleboard and a softball field. There is also a seasonal concession stand featuring a variety of menu items including burgers, hot dogs, chicken, salads and snack foods such as ice cream, pretzels and more. Restrooms and changing facilities are also located on-site. Since 2016, residents who purchase a Pool Membership are also allowed access to Tom’s Lake at Captain Michael Kilroy Memorial Park. For information on fees for the 2019 season please see below. Please click here for Registration Information which includes hours of operation. Capt. Kilroy Park has a chlorinated swimming lake with a sand beach, children’s playground, lighted basketball and volleyball court, softball field, picnic area, locker rooms and a concession stand. 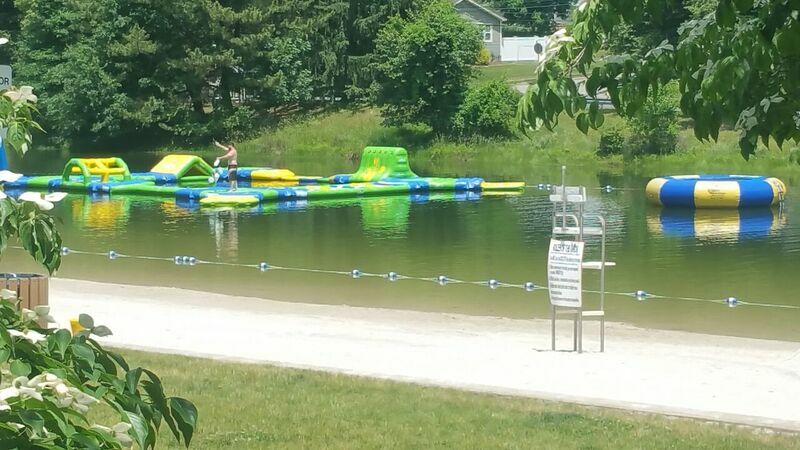 Our newest amenities include a Wibit Play Area in the water as well as a water trampoline. To view the 2019 Activities Calendar, please click here. NOTE: Kilroy will be open weekends and holidays only until Monday, June 24th. Both the lake and pool facilities are scheduled to close on Monday, September 2nd; staffing levels may cause us to close Kilroy earlier. Weekends and Holidays Facilities Open 11:00 a.m.
June 15th - July 20th Facilities Close 8:00 p.m.
July 21st - August 11th Facilities Close 7:30 p.m.
August 12th - September 2nd Facilities Close 7:00 p.m.
*Guest Passes can only be purchased AT TOWN HALL and ONLY be used by Purchasing Member’s family.